A lot of people have helped me with my rug hooking…rug hookers must be the friendliest, kindest group of people you could ever meet. However , the person whose ideas and style have influenced me the most , is undoubtedly Gene Shepherd. He suggests finding a piece of fabric whose colours please you, and use that as the basis of your colour palette. I spent a long time in Fabricland, and finally found a piece that pleased me. I realized as I began hooking a variety of the motifs, that it was more muted than I wanted, so with some suggestions from other hookers , I added the ‘acid green’, and ‘yellow’ to ‘pumpkin’ tones….the latter being used quite sparingly since they really ‘jump out’. I also added small amounts of a deeper, more vibrant blue and red. The background ‘antique black’ is spot dyed over a claret coloured cashmere with majic carpet black and bottle green dye (thanks to Rittermere’s for the recipe). It gives the background life and vitality. The majority of the colours I dyed over natural Dorr wool, with a few over a light beige tweed, and a pendleton plaid. I am using spot dyeing and dip dyeing methods. The rectangular rug is a 6 cut, and the hall runner an 8 cut. 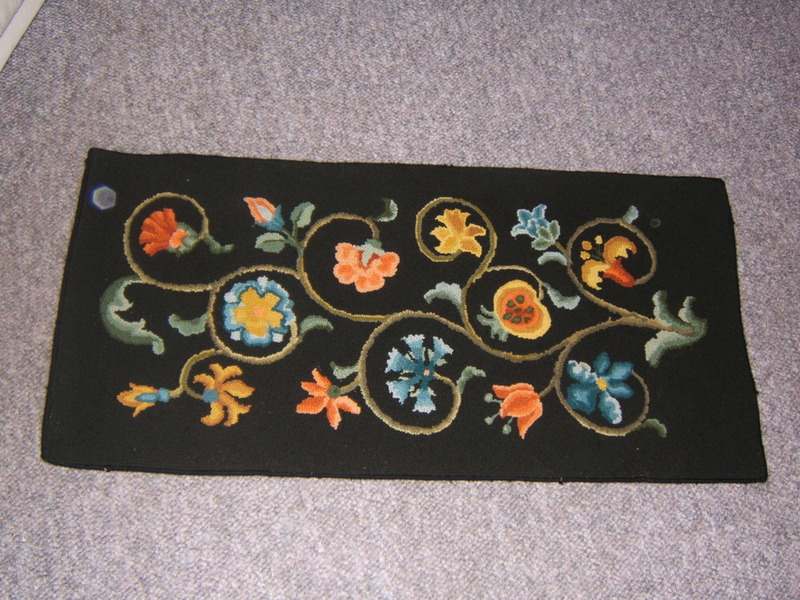 This picture shows about half of the hall runner. Now off to put today’s freshly dyed wool in the dryer. I’m very excited that Mathieu has set up this blog for me, and I’ve decided to use it initially, as a record of my journey into the art of rughooking. I’ll begin with the point I’m at now (mostly because I don’t have pictures available yet of my earlier rugs), then go back to my checkered past. I’ve been at this project a year and a half, although I’ve put it aside for large chunks of time. It consists of 2 rugs. A 10 foot hall runner and a large rectangular one. I’m hooking this one to go in the front hall in front of the doors. It is 44″ x 75″ and is loosely adapted from a Pearl McGowan pattern named Queen Anne. Getting the pattern onto the primative linen was an adventure in itself, and I would never have been able to do it without the help of my talented DH. I found the pattern as an untitled rough sketch on graph paper in a book I had borrowed from the Sunshine rughookers. I photocopied it, then cut and pasted various aspects of this to create a graph one square= 3″ that was the final size I wanted. Ray used a 5′ x 8′ sheet of ‘tintest’ and marked it out with a 3″ square grid. (the tintest is grest…firm, but porous enough to take and hold the pins easily) He set it up on the dining room table and I went to work! I used red dot and pinned it carefully to the tintest, using the grid and keeping it square.I drew the pattern using pencil and referencing my graph sketch. Then I pinned the linen to the tintest, making very sure it was square as well ( I literally counted the ditches, and pinned in the same ditch top to bottom and side to side) and pinned the red dot pattern over top. Then the hard work started. I ended up buying a whole box of black sharpies, because getting the ink to mark through the red dot onto the linen was a tough job. Of course by the time I got to the end, I realized that the easiest way was to go with the rather faint line, and free hand over it after removing the red dot. I would have saved myself A LOT of time if I had figured that out from the start. I know lots of people sew a zig zag around the rough edge, but since I am allergic to my sewing machine (I break out in a sweat whenever I’m faced with using it) I just use green painter’s tape on the edge..fold it over and it stays on beautifully. I’ll go through how I chose my colour palette next time.